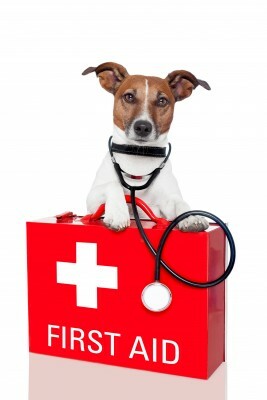 Do you need a canine first aid kit? If you own a dog, then the answer is a resounding Yes. Things happen, often through no fault of your own and you want to be prepared for any emergency. A fully stocked first aid kit will help put your mind at ease knowing that you can handle minor as well as major emergencies. Adding a few basic medications also helps keep you prepared for minor medical issues that are sure to arise from time to time. Luckily, stocking a canine first aid kit for your canine child is much the same as stocking a first aid kit for yourself with a few exceptions. It does not need to be fancy or costly and can be something you can put together from items that you may already have in your home. The key to a well-stocked canine first aid kit is that it will be easily available and well organized so you will not spend valuable time searching for the needed item. Having a complete first aid kit at home is the first step, but you may want to consider where and how the dog travels. If you take your dog on car rides, a smaller version of the kit should be kept in your car. Chances are that you might appreciate having a portable kit that fits into a backpack or purse even if the walk is short. There are two options for first aid kits for dogs. The first and easiest is to purchase a kit from the store or internet and then add items if needed. If you do decide to purchase a ready made kit, you can get a reasonably priced one on Amazon with enough supplies to cover most emergencies. The second option is to start from scratch, purchasing items from a store. To make your own, you will need a suitable container to keep all your supplies organized and neat. A small toolbox works well as well as a fishing tackle box. You can also use a cardboard box or a plastic tote. If you decide to use a cardboard box, you might want to line it or cover it in contact paper to help it last longer. Since you will be adding liquid items such as hydrogen peroxide that can spill, you will want to make sure that your container can be easily cleaned. Another option is to use a makeup bag that is large enough to add your supplies. I like to place like items in small sandwich or snack bags. An entire travel first aid kit for walks or car rides fit nicely in a gallon size bags that you can reseal. Keep one of these in your car for emergencies, canine or human and another one by the door for your daily walks. Adhesive tape as well as self-stick bandage material such as Vet wraps to apply over wound dressings. Vetwrap is stretchy and sticks to itself. Use this to cover and keep gauze pads in one place. Do not wrap too tightly. Tweezers or hemostat for removing ticks, thorns or other foreign objects. Flashlight or pocket light to help see clearly . Pocket lights are especially good if you need to check eyes. Roll gauze to make a temporary muzzle if needed or a purchased muzzle. Even the sweetest dogs can become aggressive if hurt. Here are some low cost items you can place in your home-made kit. If you don't want to mess with a liquid, try these wipes. Here are a couple of great guides in case you haven't taken a first aid course in a while. Here are a few additional items to have on hand. 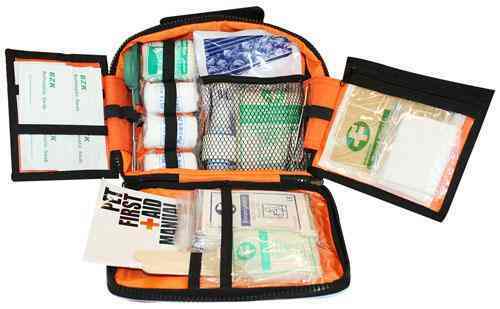 They don't need to go in your first aid kit that you carry when away from home, but they can prove invaluable for everyday and if problems should occur. Rectal thermometer and white petroleum jelly (Vaseline) for taking temperatures. The normal temperature for a dog is 101-102. Heating Pad with a non-shut off control. Keep it on a low setting. Hydrogen peroxide (3%) To induce vomiting and clean blood from a wound. Imodium A-D can be used to treat diarrhea. 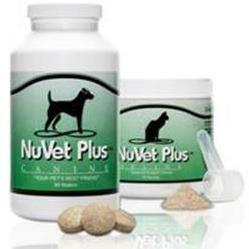 Check with your vet for dosage for your dog. Do not use until you have determined the reason for the diarrhea. 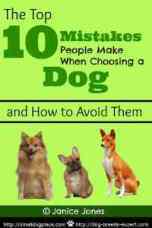 If you would like to use human medicines for your dog, please check out this page that includes dosages.